Solar panels have been around for ages, and they've all looked the same. And boring. So boring. But now there's a concept for some new solar panels that fold. They. Are. Awesome. 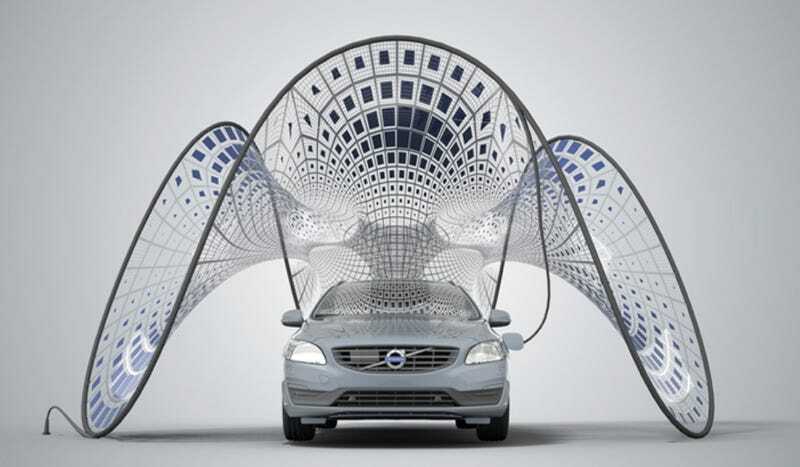 This design comes from a contest that was run by Volvo Italy. The idea was to design a solar power system that would match nicely with the V60 Plug-In Hybrid. The design from Synthesis Design + Architecture looks unlike any solar power system you've ever seen. It looks like it's from another dimension. Called the Pure-Tension Pavillion, it supposedly would work too. That's the insane part of this. It looks like something made of blown glass, but this is a real, working thing that folds out of the way when you're done. Will it ever go into production? I doubt it. But this thing rocks either way.